Depending on the variant, the second-generation Porsche Cayenne is up to 185kg (about 408 pounds) lighter than its predecessor. ContiTech Vibration Control and BASF SE, both of Germany, helped in the weight reduction by working together to create an innovative engine mount torque rod to replace the standard metal component. The new design is made of a mixture of high-strength polyamide and natural rubber, producing a lightweight material able to withstand high forces and provide good sound absorption. The new design weighs 345g, about 35 percent lighter than the 530g of a conventional aluminum part. Germany's Fischer Automotive Systems GmbH & Co. KG augments interior functionality and aesthetics in the premium SUV with its air vents, decorative gearshift cover plate and center console cupholders. 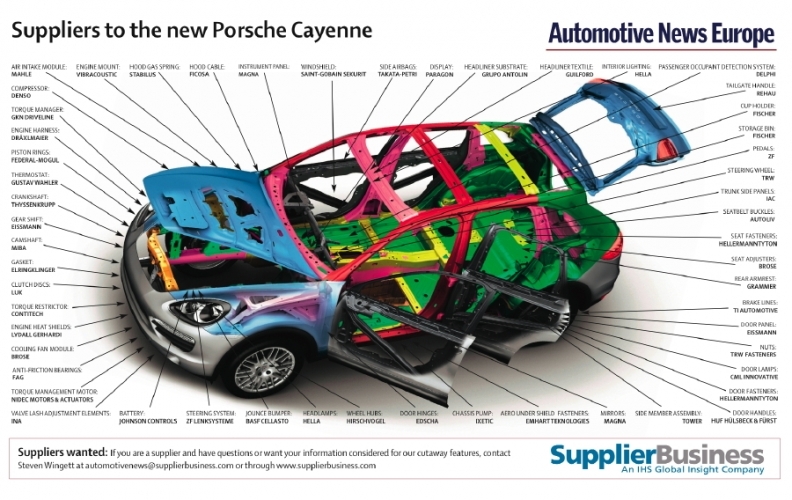 Westfalia Automotive enables the Cayenne to pull a load by supplying detachable and retractable trailer hitches. The supplier expects about one-fifth of vehicles sold to be equipped with one of its hitches. The second-generation Porsche Cayenne's model lineup is the first to offer a gasoline-electric hybrid variant alongside gasoline- and diesel-only models. German supplier Robert Bosch GmbH worked with Porsche on the hybrid system so that it would offer a smoother transition between fuel- and battery-powered driving modes when compared with conventional mechanical power-splitting devices. Bosch supplies the hybrid module – which contains the motor generator – as well as the power electronics.